Hey Google, access my bank account. Google made a splash earlier this week with a new Assistant-powered shopping initiative seemingly aimed at chipping away at Amazon’s dominance, and now it has a new target in its sights: Venmo. Google also says the service will be coming to Google Home and other Assistant-powered speakers in the coming months. But it still could be a while. You may remember that last May, Google released the Google Payment API, which let developers enable an easy-to-use checkout experience powered by Google accounts. At the time, it promised Assistant support would be added soon, and this would appear to be the fulfillment of that promise, albeit several months late. If you’re concerned about your son accidentally draining your bank account, Google ensures that every transaction requires explicit user authorization on your phone, either via your Google account password or fingerprint. It’s unclear how authentication would work on Google Home devices, though presumably it will either use voice match or an audible pin number. This is just the latest effort to get elevate Google Assistant to a pay service. Earlier this week, Google unveiled a new Shopping Actions program to enable stores to sell their wares using Google Assistant. Major retailers such as Target, Home Depot, and Costco have already signed on to the pay-per-sale model (meaning Google doesn’t get paid until a sale is made), and Google says early testing has shown 30 percent average increase in basket size for Shopping Actions merchants. Apple unveiled a similar P2P pay service through Messages with Apple Pay Cash in iOS 11.2, which also lets you use Siri to send money to friends. So watch out, Venmo. The impact on you at home: In a word, convenience. There was a time when giving a digital assistant access to our bank accounts was a scary notion, but that’s not the case anymore. Millions of people use Google Pay and Apple Pay to buy things in stores, and with fingerprint authentication, our phones are actually safer than our wallets when it comes to carrying money around. 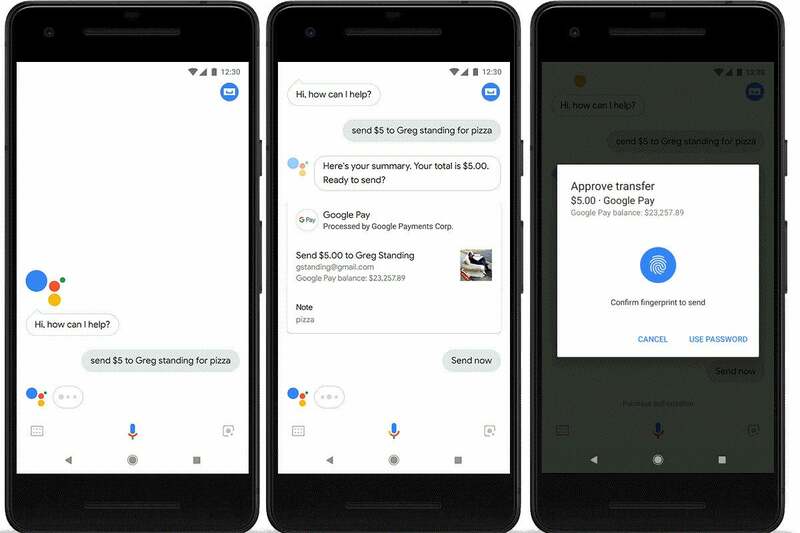 Being able to ask Google Assistant to send money to our friends is just one more way for Google to expand its ecosystem and keep Assistant as your AI chatbot of choice.